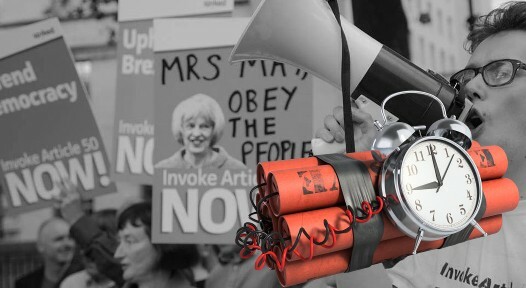 The British Gazette » Passing the time bomb! Have the lunatics taken over the asylum? The excellent and estimable Dr. North has submitted yet another incisive and authoritative blog-post (http://eureferendum.com/blogview.aspx?blogno=86630) today. Unfortunately, the cretin, Dimwit Davis apparently does not perceive the danger the UK is in. Thus the UK appears to be approaching the point of no return as for averting a no Deal Brexit. A. Seek to restart them. B. Do not seek to restart them. 1. Ask for an extension on the Article 50 clock with a view to negotiating a Brexit deal - which would have to include a transition deal. This of course would require unanimity of the EU 27 and the UK would have to comply with the previous requests to settle Phase 1 to the EU’s satisfaction. 2. Ask for a revocation of Article 50. At this point it must be pointed out that Article 50 contains no revocation provisions and appears thus to be irrevocable. However the EU is on record as suggesting that Article 50 is revocable. NB: When it comes to matters of constitutional law we enter the quasi world of “Lex rei publicae”. For instance, the Privy Council oath taken by British cabinet ministers behoves them to ensure that “no foreign prince, potentate or power shall have no precedence in this land.” Yet none have ever been prosecuted for High Treason despite numerous attempts by UKIP supporters to do so! 1. There is a divergence of opinion. 3. Given previous statements of EU politicians, it is clear that a revocation of Article 50 would require the agreement of the remaining 27 EU member states and the EU Commission as well of course the agreement of the UK Parliament as it would mean in UK legal terms the repeal of the European Union (Notification of Withdrawal) Act 2017 c. 9. As with anything that requires the agreement of “les collègues”, there are “trade-offs” and deals to be struck. Those who think that revoking Article 50 will be straightforward and “cost free” are living in Cloud Cuckoo land! Unfortunately, most of our politicians and “main stream” journalists appear to living there! IF after the EU announces the talks are suspended indefinitely the UK’s politicians will have to make a make a move VERY soon afterwards to indicate that the UK is NOT headed for a crash Brexit. IF they do not businesses many of whom have been putting plans into place will begin to implement those plans. These will be to begin relocating manufacturing and service operations out of the UK to other places in the EU and elsewhere. This will include UK call centres. At this point the politicians will likely begin to agitate. We could see another General Election. At this point, the most likely occupant of 10 Downing Street would be Comrade Prime Minister Corbyn. Comrade Corbyn will of course wish to implement his programme of tax and spend which will include renationalisation. He will have problems here. Firstly, representatives of the international credit reference agencies, Comrade Chancellor McDonnell will be told that if he does not want to have the UK’s credit rating reduced to junk status he must abandon any proposal to re-nationalise British businesses and to keep his borrowing within strict limits. The CBI will also inform that his plans to re-nationalise British businesses will scupper ANY chance of trying to tempt businesses to relocate back to the UK. Comrade Prime Minister Corbyn will then have to decide upon Option 1 or Option 2 above. The CBI and the EU may inform him that they will only accept a revocation of Article 50 – subject to a referendum should he wish. The EU might impose the requirement that the UK must enter the Eurozone by 2020. The international credit reference agencies will instruct Comrade Chancellor McDonnell that he must pay particular attention to the level of private debt in the UK as well as public debt. 1. Continue with Brexit – on the understanding that a hard (no deal) Brexit awaits. 2. Revoke Article 50 – on the understanding that the UK will have to join the Eurozone before the end of 2020. At this point many readers will ask this: How would the Editor vote in such a referendum. I would answer thus: I will NOT vote to revoke Article 50 as this is illegal as it is Treason.